You spend a lot of time everyday on the list view of your leads, contacts, accounts and deals modules. Here are some handy tips through which you can make the best use of your list views, by creating and modifying custom views, and sorting your records to see only the information you want. 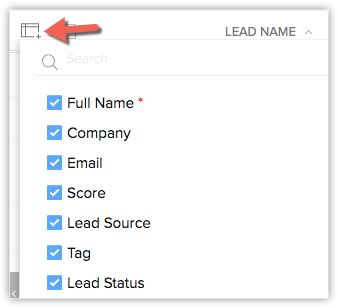 When you're in the leads' list view, you can customize the columns that you see to keep just those fields that you want and remove the rest. For example, you might want to keep the leads' full name, company name, email address, lead score, lead status and tags. This helps keeps your list clutter-free. Simply click the Add columns icon on the top right and select the check boxes of the fields that you want, and save them. Your list view will display these six columns. There's more that you can do with the list view after customizing the columns. You can sort the records in the list view based on any of these columns which will help you prioritize them. Say you want to prioritize leads through lead scores. Simply click on the Score column name and choose "Desc". All your leads will be sorted automatically based on their scores in the descending order. You can start following up with the leads with high scores on the top and work your way down. Similarly, you can sort deals based on their Expected Revenue, Deal stage or you can apply sorting to any field/column based on how you want to prioritize them. You might want to limit the number of records you want to see in a page, to avoid the clutter of too many records. If you'd rather view 10 or 20 records in a page, you can make that choice. Just like how you quickly jump to contacts based on alphabets in your phone, you can quickly access records using the alphabetic search in the list view for any module. In the list view page, click the A-Z icon on top right, select the alphabet you want, and there you go! Contacts whose names match that alphabet will be displayed.